The EUR/USD currency pair abbreviation stands for the currency of the European Union (euro) and the currency of the United States of America (U.S Dollar). Any currency pair is comprised of a base currency (in this case, the euro) and a quote currency (in this case, the US Dollar). When trading currencies in binary options, one must always look at the market price of the pair that one wishes to trade. If the market rate for the EUR/USD pair is 1.3535, this indicates that it takes 1.3535 US dollars to buy 1 euro. For the EUR/USD to be affected, factors influencing and altering the value of the euro and/or the US dollar must occur. Such factors include the difference in monetary policies set by the European Central Bank and the US Federal Reserve, as well as any influences in regards to correlations between the euro and/or the dollar with other currencies. There have been scenarios in which the US Federal Reserve has intervened during open market sessions with the purpose of strengthening the US dollar, resulting in a decrease in value of the EUR/USD pair as a consequence of the augmented value of the US dollar in relation to the euro. This means that when doing any currency trading, the trader will need to make a more informed EUR/USD forecast using the information at hand. 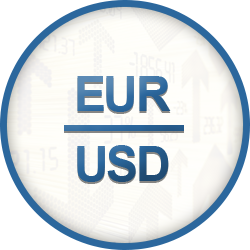 On this page you can find the live EUR/USD chart for any EUR/USD analysis you may want to conduct before conducting any binary options currency trading on this pair. Examining any EUR/USD news will also help you make a more informed EUR/USD forecast and will increase your chances making profit from currency trading.